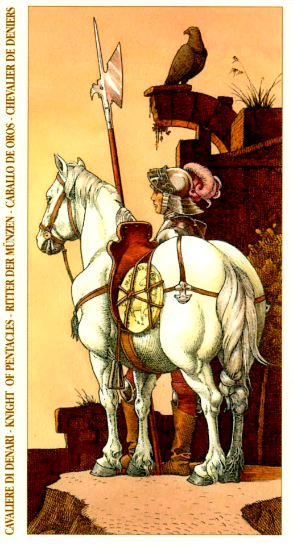 If the Knight of Pentacles is someone in your life right now, know that he may not be where he wants to be just yet, but he has his eye on the future and there is no doubt that he knows where he’s going. His gait is measured and sight is keen. He will be someone you depend on to do what he sets out to do. If on the other hand this card refers to you — as in some new educational or professional undertaking — you definitely want to look before you leap. The Knight of Pentacles reminds you that good things do come to those who wait, espeically if the focus is on preparation and planning. The card used for today’s tarotscope is part of the Tarot of Durer series which pays homage to the German artist of the Renaissance era, Albrecht Durer. Written by Manfredi Toraldo and illustrated by Giacinto Gaudenzi. This is a Lo Scarabeo deck, distributed by Llewellyn.